AsPerceived contributors may be available for media interviews. A NEW quarterly collection of journalism makes its appearance today (Thursday November 3). 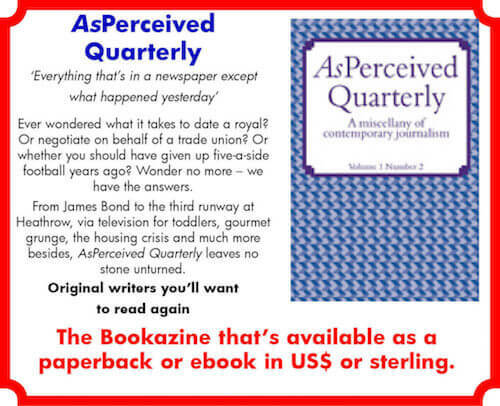 AsPerceived Quarterly is a “miscellany of contemporary journalism” that’s available in Kindle and paperback formats produced by Leeds-based freelance Adam Christie and Guardian journalist Brian Williams. Aiming to be informal, informative and entertaining, the first edition runs to about 50,000 words and includes a highly-topical and so-far unique assessment of how the childhood of Donald Trump provides a key to the character and behaviour of the Republican nominee for US president together with a surreal tour round Dublin, 100 years after the Easter Rising. Other contributions cover Premier League football, the latest trend in motoring and car ownership, a reassessment of attitudes towards mental health, as well as travel, politics and the media. The start-up has adopted an unorthodox business model that has evolved through many years of monitoring trends the publishing industry. “APQ is funded with ‘risk time’ rather than risk capital,” said Adam Christie, “that involves the contributors in a profit-share co-operative and vital protection for the creators’ rights. “No more than very short extracts are available online – so if you want it, you have to buy it. “We are eschewing advertising, because trying to follow this market is expensive and destructively unpredictable as the industry knows to its cost. Brian Williams, whose lament for West Ham FC leaving its historic home – Nearly Reach the Sky; A Farewell to Upton Park­ – was published last year, says issues of APQ should cover everything that’s in a paper except the news. “The ‘bookazine’ format and content are intended to be most convenient for today’s very busy world, so commuters can use e-book readers on their tablets and phones or choose the paperback version if that’s what the prefer,” said Brian Williams. Each edition includes pieces of between about 1,500 and 4,000 words, giving writers time to consider their subjects without the constraints of most newspaper or magazine features. Plans for the second edition which will appear early in 2017 are already well advanced.